Himalaya Journey Treks & Expedition:: Everest base camp & Gokyo Ri Trekking | Everest base camp Cho la pass trekking | Everest base camp Cho la pass Gokyo valley trekking | Kala pattar Everest base camp & Gokyo lake trekking | Gokyo kala pattar trek | Gokyo Everest base camp trek : Evrest base camp & Kala pattar trekking : Everest base camp cho la pass trekking : Everest base camp trek information | Trek to kala pattar & Everest base camp | Lukla Everest base camp trekking | Kathmandu Lukla flight ticket : Everest Basis lager trekking | Kala pattar Gokyo trekking : Gokyo ri trekking via Everest base camp : Kala pattar Cho la pass trekking | Everest base camp & Gokyo lake trekking. Everest base camp and Gokyo Ri trekking is the popular trekking trail in Everest Region where Trekkers will see panoramic views of Khumbu Himalayan range including Mt. Everest, Mt. Makalu. Mt. Lhotse, Mt. Cho Oyu , Mt. Nuptse , Mt. Amadablam , Mt.Pumori, Mt. Thamserku etc and Tibetan sherpa culture. Walking through the Sherpa and Tamang villages, there lies the great chance of experiencing their unique culture. One can always enlighten oneself at the traditional Buddhist Monasteries about the belief and riches of Buddhism. You can enjoy the breathtaking views of the mountains, see the hard working Yak and many kinds of wildlife in Everest region. Gokyo Ri and Everest base camp trekking is Moderate to Strenuous trekking which you can do from Gokyo valley via over Cho la pass 5420m and continuity for onward journey to Everest base camp and kala pattar. Gokyo valley to Everest base camp treks offer not only spectacular Himalayan views but challenging with famous cho la pass. For Gokyo valley and Everest base camp, you are able to arrange trip whether by bus from Jiri or by fly Kathmandu to Lukla. 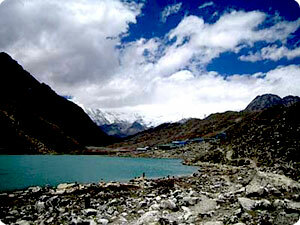 Splendid breathtaking place: Trek in the Everest region and touch the Mount Everest. Day 01: Arrival in Kathmandu (1334m), transfer Hotel,Everest base camp & Gokyo lake trekking briefing with officially arrangments. overnight at kathmandu. Day 02: Katmandu by flight to Lukla (2830m) and overnight at Phakding (2630m). Day 10: Lobuche to Dzongla (4800m). Day 19: After breakfast, our tour guide will take to for historical monuments sightseeing in kathmandu valley such as Boudhhanath : visit Bodhnath Stupa, one of the biggest Buddhist shrines in the world, where we observe Buddhist monks in prayer in the monasteries surrounding the stupa than visit Pashupatinath: the most famous Hindu temple in the country, located on the banks of the holy Bagmati River. Here you see Hindu holy men (sadhus) meditating, pilgrims bathing and occasionally funeral pyres burning on the ghats. Bhaktapur: you will enjoy with different spectacular Himalayan scenery , old architecture, 55 windows, Pottry farm, king curd and old style primitive houses. Kathmandu durbar square: you will enjoy with different Hindus Temple, Goddes Kumari, legend of kathmadu valley.Monkey temple(swyambhunath): you will enjoy with Budhhist stupa from where you will see whole kathmandu valley view including the Himalayan views ,Patan Dubare square: Patan city is the temple city of Nepal where you will see the many temple,Mahabudhha , Golden temple etc and in the evening farewell dinner in Nepalese Restaurant, overnight at kathmandu in Hotel. Day 20: After breakfast, relaxing or shopping with own activities than drop to international airport for onward destination.